Today MSI unveiled their latest notebook line of notebooks, the GP series designed for mobile productivity, entertainment, and gaming. 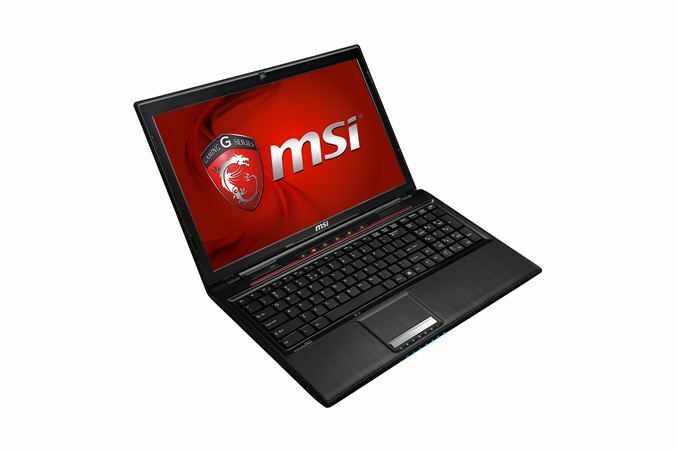 For those not keeping track, that means MSI now has five different gaming laptop/notebook lines: GP, GX, GE, GS, and GT. Those are ordered roughly in line with increasing performance, with the GX series being something of a wildcard as it uses AMD APUs instead of Intel CPUs but includes a high-end AMD GPU. There’s a decent amount of overlap between the series as well, with the GE and GP notebooks in particular using what appears to be the same chassis but differing components. The big draw on the GP series is going to be lower prices (relative to the GE series), but if you’re hoping for high performance gaming you’re likely going to be disappointed. Here’s a quick rundown of the specifications of the announced GP notebooks, although at present only the GP60 has a product page on the US MSI site. The new GP series currently has two chassis sizes: 15.6-inch and 17.3-inch. The fastest/”best” model is the middle column, which includes a quad-core processor, 1080p display, and a 7200 RPM hard drive. The GP70 currently lists one model with a 1600x900 display and a dual-core i5-4200M processor, as well as a 1TB hard drive (presumably 5400 RPM). There’s a GP60 that’s basically the same except with a 750GB hard drive (again, presumably 5400 RPM) and a 1366x768 glossy display. We haven’t personally seen or tested any of these notebooks, so I can’t comment on the quality of the displays, but hopefully at least the GP60 2OD-072US 1080p LCD is a decent offering (but don’t hold your breath). Other than the CPUs, the GPU is going to largely determine what sort of performance you can expect from these notebooks. Using the Kepler GK107 core, the GT 740M delivers at least reasonable performance in most games. My own testing suggests that medium quality 1080p gaming is possible and most titles, and high quality 1366x768 is usually an option as well, but you’re definitely not going to be able to Max out settings in demanding games, and the use of DDR3 instead of GDDR5 means antialiasing will likely prove too much for the graphics chip. Also worth a quick note is that MSI lists 8GB of RAM, and given what we’ve seen with several of their other notebooks I expect they’re using a single 8GB SO-DIMM and leaving the second SO-DIMM slot unpopulated, which means you can easily upgrade to 16GB (2x8GB) if you so desire. Most of the other features are unremarkable, but it’s interesting to note that MSI is apparently choosing to go with Windows 7 Home Premium on all of their GP series notebooks – yet another vote of no-confidence for Windows 8. Also note that the GP60 with the quad-core processor includes a 120W power adapter instead of a 90W adapter. These new GP series notebooks are being unveiled today, but it appears that availability is immediate – Newegg currently stocks all three models. What’s more, Newegg’s pricing is $100 less than the MSRP in all three instances. That’s actually really good news, as the MSRP seemed high to me. Of course the GE60 and GE70 are still available if you need/want more performance, but you’re basically looking at roughly $250 extra to upgrade to the GTX 765M, which means the GP series is definitely the better bargain. If you really want a faster gaming notebook, I’d suggest making the jump to something with GTX 770M or higher instead; you can find GTX 770M laptops starting at $1400 so it’s basically $200-$250 extra for each additional 30~50% in GPU performance (meaning, GTX 765M is 30~ 50% faster than the GT 740M, and GTX 770M should be another 30~50% over GTX 765M). If you're looking for a good gaming capable laptop in a business professional package (The GP60/70 look more business friendly which is a draw) I recommend the Dell Precision M6800. They're firepro GPUs hold up well for games (between 8870m and 8970m), they're pretty rugged for travel, and they won't make your boss frown when you take it to a client's site.